The topic of marriage has always been a sticky one. Moses allowed divorce, “but from the beginning it was not so.”(Mt 19:8) Followers of Christ were to be held to a higher standard. However, human nature doesn’t change. Hearts are still hard and marriage is more so. So, in an era of widespread marital instability, it’s rather unremarkable that Christ’s – and, therefore, the Church’s – position on marriage should be challenged. In this instance, Cardinal Walter Kasper, speaking on behalf of a sizeable percentage of Catholics in the western hemisphere, delivered a speech at an extraordinary consistory on the family that discussed “the gospel of the family.”[i] In it, he asked the Church to consider the situation of civilly-remarried divorcees. Cardinal Kasper acknowledged that the Church cannot deny Christ’s teaching about the indissolubility of sacramental marriage and, therefore, there can be no possibility of entering into a new marriage while a living spouse remains. But he suggested that, even as John Paul II removed the automatic excommunication of civilly-remarried divorcees, the Church might find a way to “open doors” without violating dogmatic teachings. If civilly-remarried divorcees are not excommunicated but may receive spiritual communion under the usual conditions and are therefore considered as one with Jesus Christ, Cardinal Kasper argues, why can’t they receive sacramental communion? 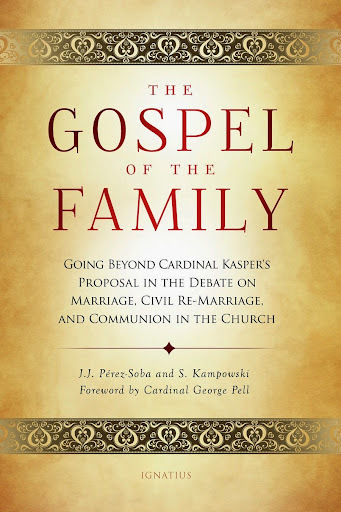 To explore this question, Juan Jose Perez-Soba and Stephan Kampowski have written The Gospel of the Family: Going Beyond Cardinal Kasper’s Proposal in the Debate on Marriage, Civil Re-Marriage, and Communion in the Church. Father Perez-Soba is a moral theologian teaching at the Pontifical John Paul II Institute for Studies on Marriage and Family in Rome and Dr. Kampowski is professor of philosophical anthropology there. Perez-Soba and Kampowski begin their examination with a consideration of the family, “the first and inescapable expression of the vocation of love… The personal integrity that the family requires is the testimony that makes this love credible in the world.” This is an interesting beginning because it frames the discussion about marriage in the context of the “nuclear” community rather than the individual spouse. The Perez-Soba and Kampowski book is organized around three themes: the cultural condition of today’s contemporary family, the centrality of the family to the Christian message, and the pastoral care that is most efficacious for today’s family. Concerning the contemporary family’s cultural challenges, there is little said here that will come as a surprise. Today’s family stands in stark contradiction to neo-pagan sexual mores that sunder sexual relations from love and commitment. And this is “good news,” say Perez-Soba and Kampowski, because it proclaims the possibility of “true love,” between husband and wife as well as between man and God. The discussion is complex and fascinating, exploring gender theory and a host of other contemporary topics from a scriptural perspective, from the vantage point of recent papal documents, and from sociological considerations. Perez-Soba and Kampowski are so thoughtful in setting forth their points that one wonders how Cardinal Kasper might respond. The upcoming Synod is titled “The Pastoral Challenges to the Family in the Context of Evangelization.” Just as the family is designed to be a person’s first school in love, commitment (fidelity), and sacrifice, it is also the starting point for evangelizing both the individual and society. Conversely, the family’s failure quickly becomes the Church’s loss. Mary Eberstadt, who wrote How the West Really Lost God, says mainline liberal Protestant and Anglican churches are committing “assisted religious suicide:” “In sum, the churches that did most to loosen up the traditional moral code of Christianity are the same churches that have ended up suffering most for that effort—demographically, financially, morale-wise, and otherwise. Some are on the brink of actual extinction” (pp 44-45) due to their failure to take the family seriously. The historical practices of the Church in this regard are interesting and insightful, above and beyond the witness of Saint John the Baptist and the English Martyrs who “shed their blood in defense of the sanctity of the marital bond.” (p. 129) Perez-Soba and Kampowski painstakingly argue against false assertions that the early Church accepted remarriage after divorce and then present evidence that, indeed, the Church accepted no such thing. Even the few texts cited by Cardinal Kasper to support his proposals – in counter distinction to many unambiguous one – are revealed, on closer examination, to support nothing of the sort. If one is not “simply to adapt to the demands of the present day,” (p. 172) then it becomes obvious that it “is altogether inadequate to design a pastoral program that does not take into account the moral truth of the action performed in light of the law, or that falls into the temptation to measure its actual expediency only by means of technical results, or else that confuses mercy …with compassion to the detriment of the truth of justice.” (p. 174) Better catechesis, ecclesial support, but above all “the gift of indissolubility” (p. 174)are the resources on which any efficacious pastoral care must be grounded. 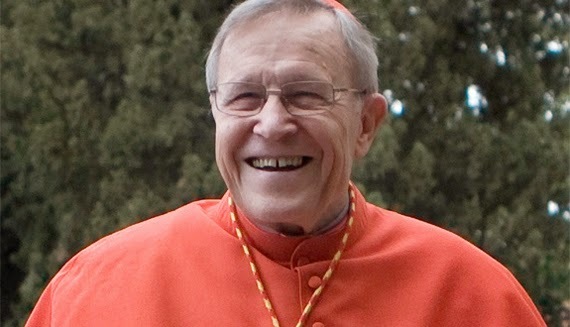 Given that Cardinal Kasper’s thoughts about marriage and the Church’s pastoral response to civilly-divorced remarried Catholics will be much under consideration during the Synod on the Family, Perez-Soba and Kampowski have provided a very useful, readable response formed from the Church’s traditional teachings about marriage. It couldn’t come at a better time. Spero columnist Stephanie Block is a syndicated columnist. She is also the author of the four-volume 'Change Agents: Alinskyian Organizing Among Religious Bodies,' which is available at Amazon. 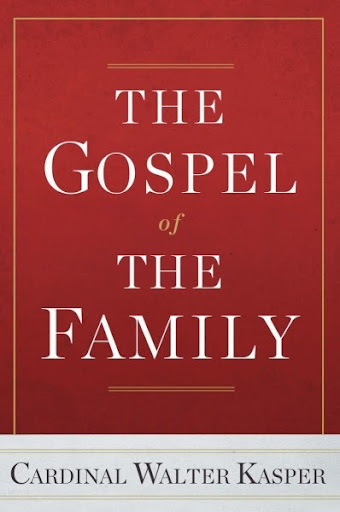 [i] Cardinal Walter Kasper has written a booklet with the same title: The Gospel of the Family, Paulist Press (2014). Perez-Soba and Kampowski are primarily considering this writing, whose ideas will presumably be considered at the Vatican’s October 2014 Synod on the Family. [iii] Address of His Holiness Benedict XVI to the Participants in the Ecclesial Diocesan Convention of Rome”, June 6, 2005, p. 5.